Is Your Rental Equipment Ready for Hurricane Season? When disaster strikes, heavy equipment gets called into action to aid in the recovery efforts. Some types of disasters are unpredictable, but weather like hurricanes can be relied on to show up year after year—and luckily you can see hurricanes coming days away. The storm report information helps give you time to prepare to make sure your equipment rental fleet has the proper inventory in the proper condition for your clients when the next storm hits. Here are a few tips for using technology to keep your assets fit for quick deployment. Think of disaster recovery as a specific kind of project. The same data analysis that helps you estimate the cyclical number of assets and type/class of equipment can help you anticipate the likely rental needs for peak hurricane season. You can use detailed data from previous storm seasons with the annual weather forecast to predict what you will need to put in place for the current year. 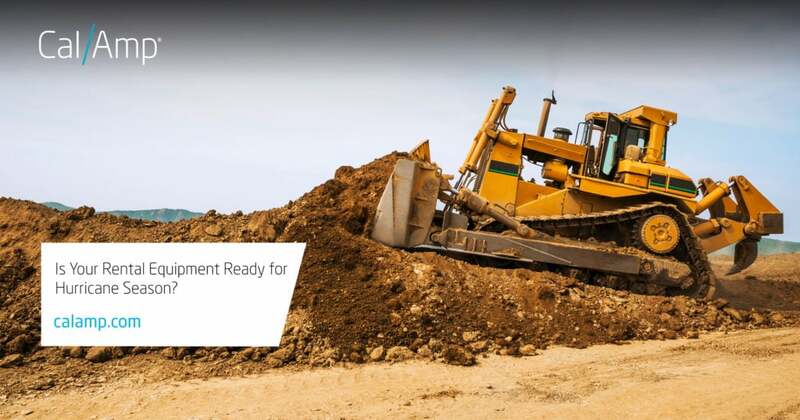 Heavy equipment telematics solutions provide both real-time and aggregated data about asset utilization that documents how your equipment was used during past storm recovery jobs. This information makes it easier to right-size fleets, choose the best manufacturer or class type and manage total inventory levels. Analyzing historical data can also help you identify outliers—equipment that is unusually problematic or especially useful. Another huge benefit of asset telematics is the solution’s ability to give you a real-time heads up when any piece of equipment in your fleet needs repair or maintenance. Telematics solutions have become advanced, as well as reliable and affordable. They provide data streams of engine health, location, operator behavior, utilization and other operational information. You can use this information to make sure that equipment is properly maintained, any problems are repaired before a storm makes landfall, and that the whole fleet will be available when it is needed. For example, one client tests their generators on a weekly basis to gather health metrics across multiple rental locations. During the storm and recovery work, real-time location and condition data can help you see the big picture of how your fleet fared if it was in the storm zone and where it is being utilized during the recovery process. When asset locations are overlaid on maps integrated with weather, traffic and other geographical data, managers can plan routes to avoid these new obstacles and hazards, helping them get where they are needed efficiently. In the event that the storm is severe enough to require complete evacuation, you can use telematics data to locate equipment remotely and evaluate the condition of your fleet. Here are few non-technology tips to help you through these tropical systems. Before a storm hits, meet with your staff and form a plan. Make sure you are on the lists of equipment suppliers maintained by state and federal agencies so that they know to call you when they need a specific piece of equipment for a particular area. If possible, work with local weather agencies to try to predict the size of the storm’s impact so you can rent out your equipment ahead time instead of waiting for calls from people who might already be in a panic mindset. Lastly, don’t forget to top off fuel tanks and have a refueling plan in case of power outages. Good relationships with your suppliers are a must! To learn more about how CalAmp’s asset telematics solutions can help you prepare your rental fleet for hurricane and other bad weather seasons, visit our page here. Heavy construction equipment theft affects rental companies too. Sometimes equipment isn't returned or a renter provides fraudulent information on the contract. Of course, the theft of rental assets occurs on the jobsite.